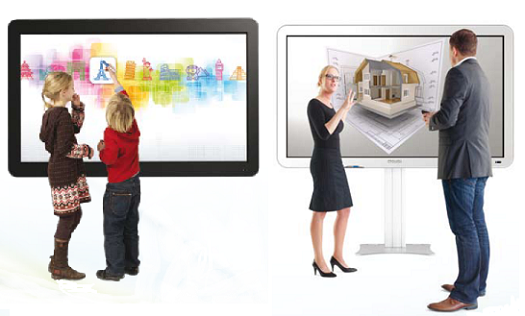 The CTOUCH Laser is the latest generation of large format Interactive LED Touch Screen. The multi-touch surface opens the world of touch technology to large audiences increasing engagement, involvement and collaboration. Compatible with Windows, Mac and Linux platforms. Touch screens offer an excellent alternative to the traditional interactive whiteboard with projector and offer many new exciting features designed to enhance any presentation or lesson. 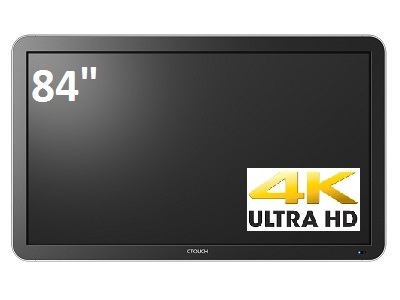 The 84" Ultra HD 4K LED Interactive Touch Panel Display features a 5mm toughened anti-glare screen providing a 4K Ultra High Definition picture with ten points of interactive contact. The elegant design means that the screen is not only suitable for education and meeting rooms but would not look out of place in any corporate boardroom. There are a comprehensive range of mounting options from basic wall mounting to a mobile trolley with swivel head so that the screen can be used like a desk. The CTOUCH Laser models come with a full range of software and accessories to maximise their use in operation and flexibility in installation. The screens can also operate on third party software not included like Smart or Promethean. Oktopus makes it even easier for you to create engaging and dynamic lessons, with over 70 individual tools for learning, including geography, literacy, science and mathematics resources and a collection of floating tool palettes. Open as few or as many of the tools at any one time, select assets from a 3,400 strong media bank, combine online and offline content, create content ‘on-themove’, quickly save/store lessons or share your content on the Oktopus share site. Ultra High definition 4K Resolution.